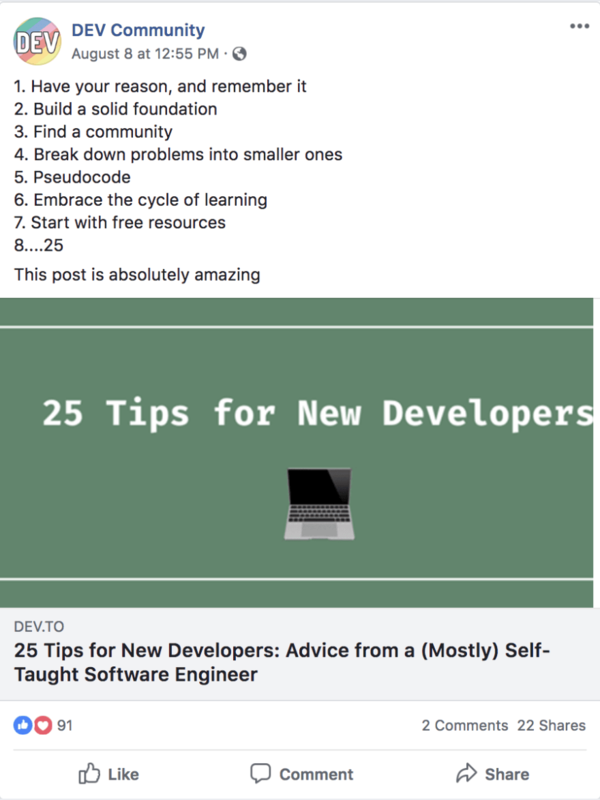 I'm going to use a lot of Facebook examples throughout this post since they wrote React in the first place! Remember when Facebook moved from just likes to reactions? Instead of just being able to like posts, you can now react with a heart, or a smiley face, or a like to any post. If those reactions were primarily made in HTML, it would be a tremendous amount of work to change all of those likes to reactions and to make sure that they work. This is where React comes in -- instead of implementing the "separation of concerns" that gets impressed upon developers from day one, we have a different architecture in React that increases modularity based on a component structure instead of separating the different programming languages. Today, we'll keep the CSS separate, but you can even make that component specific if you want! To make this tutorial a little more succinct, some code examples have ... before or after them, which means that some code was omitted. I use Git diffs in some places to show lines of code that will change, so if you copy and paste, you need to delete the + at the beginning of the line. I have full CodePens with the completed versions of each section -- so you can use those to catch-up! More advanced concepts that aren't essential for the tutorial are in blockquotes, these are mostly just facts that I think are interesting! If you are creating a production React application, you will want to use a build tool, like Webpack, to bundle your code since React utilizes some patterns that won't work by default in the browser. Create React App is super helpful for these purposes, since it does most of the configuration for you! I also made a Codepen template that you can use! For this tutorial, we will be building a Facebook status widget, since Facebook wrote React in the first place! Think about how many places the like widget appears on Facebook -- you can like a status, or a link post, or a video post, or a picture! Or even a page! Every time Facebook tweaks something about the like functionality, they don't want to have to do so in all of those places. So, that's where components come in! All of the reusable pieces of a webpage are abstracted into a component that can be used over and over again, and we will only have to change code in one place to update it. Let's look at a picture of a Facebook status and break down the different components within it. 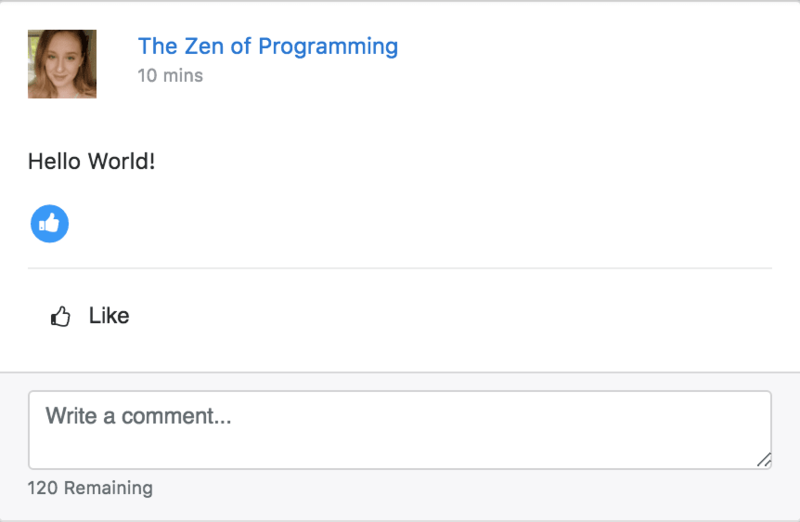 The status itself will be a component -- there are lots of statuses within a Facebook timeline, so we definitely want to be able to reuse the status component. Within that component, we will have subcomponents or components within a parent component. Those will be reusable as well -- so we could have the like button component be a child of the PhotoStatus component and the LinkStatus component. We can even have subcomponents within subcomponents! So, the group of like, comment, and share could be it's own ActionBar component with components for liking commenting and sharing within it! There are a bunch of ways you could break down these components and subcomponents depending on where you will reuse the functionality in your application. I wanted to start off this tutorial with a React "Hello World" -- it is tradition after all! Then we'll move to the slightly more complex status example. In our HTML file, let's add just one element -- a div with an id on it. By convention, you will normally see that div have an id "root" on it since it will be the root of our React application! Now, let's get to our React code! All that happens is that "Hello World" is displayed as an H1 on the page! Let's walk through what's going on here. First, we are using an ES6 class that inherits from the React.Component class. This is a pattern that we will use for most of our React components. Next, we have a method in our class -- and its a special method called render. React looks for the render method to decide what to render on the page! The name makes sense. Whatever is returned from that render method, will be rendered by that component. In this case, we are returning an H1 with the text of "Hello World" -- this is exactly what would be in the HTML file normally. We are using the ReactDOM functionality to attach our react component to the DOM. JSX is actually optional in React, but you'll see it used in the vast majority of cases! All in all, in this ReactDOM.render statement, we are attaching our HelloWorld component to our div that we created in our HTML file. Okay -- now that we've done a "Hello World," we can get started with our Facebook component. First, I want you to play around with this demo. We'll be working on this throughout the rest of the tutorial. Feel free to look at the code too, but don't worry about not understanding it! That's what the rest of the tutorial is for! Here's a Codepen with the full starter code. For the sake of this tutorial, we will be creating four components: a Status component which will be the parent, a Like component that will encompass the liking logic, and the Comment component which will contain the logic for typing in a comment. The Like component will also have a child LikeIcon that will show up or be hidden when you toggle the like button. Let's go ahead and divide the HTML code that we've written into those components. We'll start with the shell of a component, and we'll render it as well to make sure it's working! We can also delete the content of our HTML, leaving just an element with the ID root -- the parent "content" div is just for styling! Here's the HTML that is going to go in the Status component. Notice, some of the original HTML isn't there yet -- it's going to go into our subcomponents instead! Let's create a second component, and then we'll include it in our Status component. Here's the component for our comment. It just has our textarea to type in, and the text with how many characters we have remaining. Notice that both are wrapped in a div -- this is because React requires us to wrap all the contents of a component within one HTML tag -- if we didn't have the parent div we'd be returning a textarea and a small tag. So, now we need to include this component within our Status component since it will be our subcomponent. We can do so using that same JSX syntax we used to render the Status component! Okay, now we just need to do the same for our likes! Then we need to include it in our original Status component! Cool, now we have React-ified our original HTML, but it still doesn't do anything! Let's start fixing that! All in all, the code from this section will look like this CodePen! Let's start working on these! Imagine that we wanted our comment box to allow for a different number of letters in different places. On a status, for example, we want a user to be allowed to write a 200 letter long response. On a picture, however, we only want them to be able to write a 100 character response. React allows us to pass props (short for properties) from the PictureStatus component and the Status component to specify how many letters we want to allow in our response, rather than having two different comment components. The props look like HTML attributes! If you are passing a string via props, you don't need the brackets, but any other data type or a variable needs to be within the brackets! They are bundled together in the props attribute of the instance so they can be accessed with this.props.myPropName. So, let's change the hardcoded 140 characters to be easily changeable outside the component! Then we'll change the hardcoded 140 character limit in the Comment component. The props that we pass from component to component will never change within the child component -- they can change within the parent but not within the child. But -- a lot of the time we will have attributes that we will want to change within the life of a component. For example, we want to keep a tally of how many characters the user has typed into the textarea, and we want to keep track of whether the status has been "liked" or not. We will store those attributes that we want to change within the component in its state. You'll notice a lot of immutability within React -- it is highly influenced by the functional paradigm, so side effects are also discouraged. We want this state to be created whenever we create a new instance of a component, so we will use the ES6 class constructor to create it. 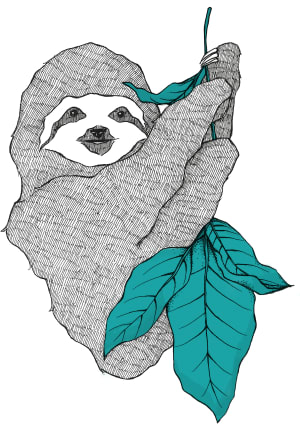 If you want a quick refresh on ES6 classes MDN is a great resource! State is going to be an object with any key-value pairs that we want to include. In this case, we want a characterCount of how many characters the user has typed. We'll set that to zero for now! Now let's subtract that from the maxLetters prop, so we always know how many characters we have remaining! If you increase the characterCount, the characters remaining display decreases! But -- nothing happens when you type! We're never changing the value of characterCount. We need to add an event handler to the textarea so that we change the characterCount when the user types! We are going to add a onChange handler to our textarea. Inside of it, we will place a reference to an event handling method that will run every time the user types in the textarea. Now we need to create a handleChange method! Now we need to update the characterCount attribute in state. In React, we never directly modify state, so we can't do something like this: this.state.characterCount = event.target.value.length. We instead need to use the this.setState method. But! You get an error -- "Uncaught TypeError: this.setState is not a function". This error is telling us that need to preserve the context of the es6 class within the event handler. We can do this by binding this to the method in the constructor! If you want to read more about this, here's a good article! Okay! We're almost there! We just need to add the ability to toggle the like showing up! We need to add a constructor to our Like component. In that constructor, we need to instantiate the component's state. The thing that will change within the lifecycle of the component is whether or not the status has been liked. Now we need to add an event handler to change whether or not the status has been liked! The difference here is that the callback function that this.setState receives a parameter -- previousState. As you can probably guess from the name of the parameter, this is the value of state before this.setState is called. setState is asynchronous, so we can't depend on using this.state.liked within it. Awesome! Now all of our functionality is in place! If you feel like you're in over your head already, feel free to skip this part, but I wanted to make one more quick refactor to this project. If we create components that don't have state associated with them (which we call stateless components), we can make our components into functions instead of ES6 classes. We just return the UI of the component instead of using the render method! Here is a CodePen that implements this refactor! 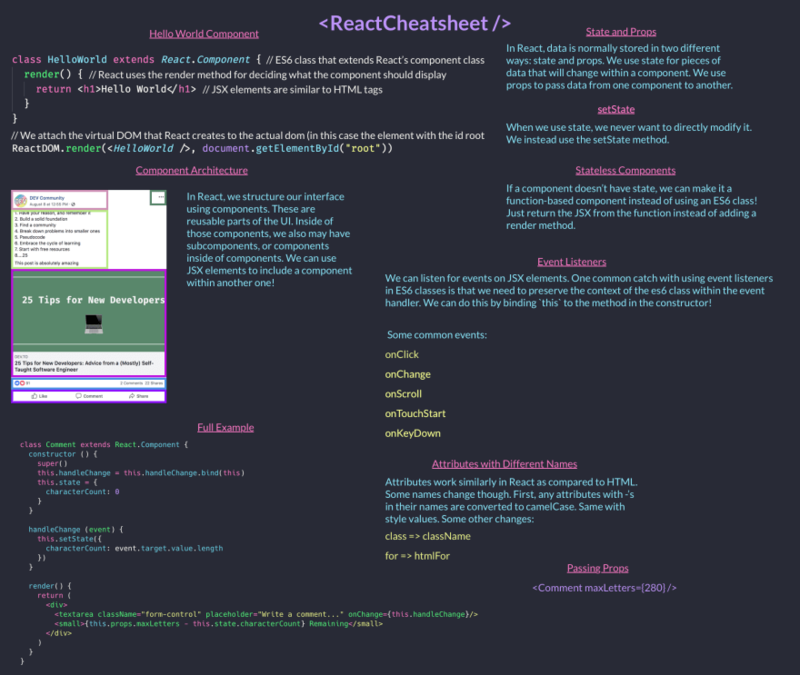 I love cheatsheets, so I made one with the content from this post! You can also download it as a PDF here! To recap, we talked about the component architecture, the basic React syntax and JSX, state and props, event handlers, and functional components. If you would like to view all the CodePens from this tutorial, here is a collection! If you would like to try to extend the code from this tutorial, I would recommend changing likes to reactions or creating a photo component that reuses some of the components that we made! 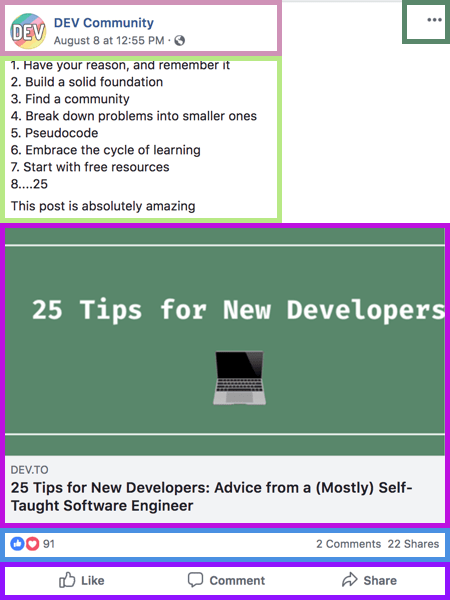 If you liked this article and want to read more, I have a weekly newsletter with my favorite links from the week and my latest articles. Also, tweet me about things you want me to write tutorials on, or constructive feedback on how I could make these easier to follow! If you have any questions, my AMA repo is the best place to reach me! This is so much like some of the very early React how-tos. Things had gotten way overly complicated since then. People sort of forgot about the basics, but the original tutorials are out of date. Getting rid of all the tooling to understand the concepts. I also wrote a tutorial on this topic, without tooling or ES2015 features, to get people up to speed! I appreciate the amount of efforts put ting this article together: codepen, git diff, cheatsheet, react concepts, etc. for us to read in about 10 minutes. More importantly, how you break down and approach the problems and writing solutions. You are awesome. Ah thank you so much!! Glad it was helpful! This way our "this" is the method's parent Class. You can do that -- its a Babel feature, so its not implemented in JS, it also has some performance issues. I like the syntax, but its still perfectly valid to bind in the constructor, which IMO is easier to explain. I will try to check more about performance (I didn't have problems with that), so thanks for suggestion! Thank you Ali for providing such a great start to React! I noticed that there's a missing closing tag at the end of the browser.js declaration. 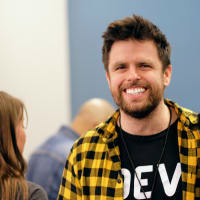 @aspittel, thanks for sharing great article. I noticed when I load the babel script in browser, it give me error in console. React, Vue and Angular are all great for building Hello Worlds, the ugliness starts with more complex projects where you'll find yourself reinventing the wheel day-to-day. Probably Angular has it best in this regard. Thanks for sharing Ali. Great intro. To compliment this, the Syntax podcast recently did a podcast episode on React for beginners for those interested. 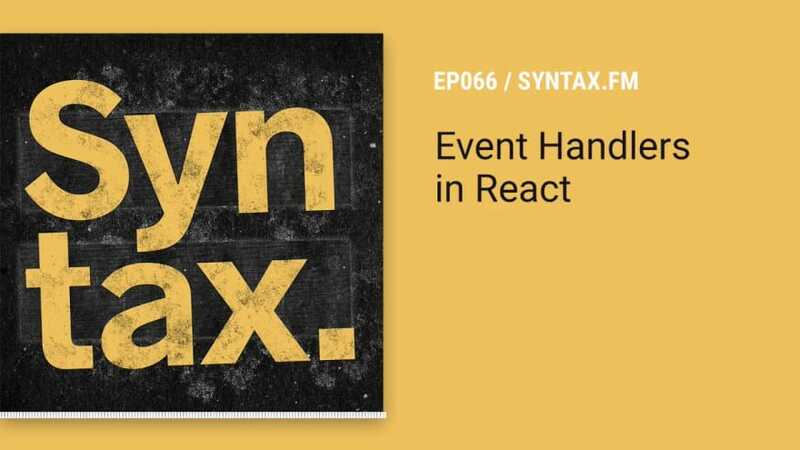 Big React episode on @syntaxfm today! Bringing it back to the basics and covering all the fundamental ideas and concepts of React. Enjoy! Gooshh! Just what I needed! Thank you so much! This is perfect, I start doing my react app next week! This is fantastic, I've been looking for a write up like this. Thank you so much!! I was (actually, still am, but I'm doing it in parts) working on something similar, a React guide that goes through all the basics. This one is pretty good, congrats, Ali. super awesome :). luv it.